The writer and translator Anne Plumptre (1760-1818) and her sister Annabella, also a writer, divided their time between Norwich and London, where they moved in radical and dissenting circles. 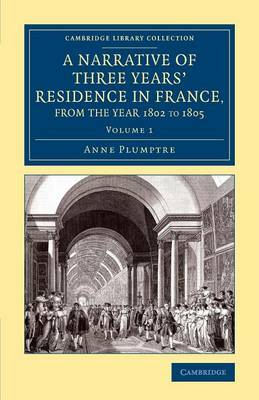 Anne also travelled abroad, publishing this three-volume description of three years' residence in France in 1810. (Her 1817 volume on Ireland is also reissued in this series.) Like many other Britons, Plumptre took the opportunity of the Peace of Amiens to visit post-revolutionary France, and she stayed in the country until hostilities recommenced in 1805. Sympathetic to the revolution, she intended to examine for herself the state of the country and its people, and compare her first-hand impressions (especially of Napoleon) with the generally hostile information about France then currently available in Britain. Volume 1 describes her stay in Paris (where she was accidentally locked in the ruins of the Bastille at nightfall), and her journey to Marseilles via Lyons.